Now Available: Version 8.4 with 5-string dual-octave tanpuras, background play, integrated Auto-Tuner and Swar Mandal! Check out the YouTube demo or the audio sample below for the fantastic new sound. Note: All updates are always free! iTanpura runs fine on the new iPad. However, before buying please consider iTablaPro which has all iTanpura features plus tabla thekas in 30+ taals and variours styles as well as a native iPad interface. ★★★★★ "Excellent app, superb sound quality"
★★★★★ "Concert-quality tanpura in your pocket"
iTanpura now featured in the culture section of Indian publication Mint - reviewed by none other than the famous classical & playback singer, the inimitable Shubha Mudgal. Shubha-ji called me from India over Skype for an interview that was certainly fascinating for me. She is an amazing and dynamic personality in the world of music, so this was certainly an honor for me. Click here for the complete article. iTanpura was also written up in the Indian Express, which is one of India’s oldest newspapers. See here for the complete article. Not convinced? Try iTanpura Lite for free! It has most the features of the full version, except the sound stops playing after 60 seconds. Click here to download. The Tanpura is a musical instrument widely used to accompany Indian Classical music. It is a 4-stringed instrument with a base made from cured pumpkin gourd and a wooden stem. It is tuned to the chosen pitch or key and provides a constant background "drone" or frame of reference against which the rest of the vocal or instrumental music is performed. The middle two strings of the tanpura are always tuned to upper Sa, the last string to lower Sa (kharaj). The first string varies depending on the raag or scale being performed. Vocal performers frequently sing with two tanpuras tuned to the same pitch but with a different note for the first string. iTanpura uses stereo digital sound to simulate a set of two tanpuras each of which can be tuned with a different string combination. It uses sounds sampled from real Hemraj tanpuras to provide beautiful yet realistic sound in a pleasing and intuitive package. And now iTanpura also includes fantastic Swar Mandal sound (with presets for 75 raags) for an instant concert atmosphere guaranteed to inspire! iTanpura is ideal for everyday music practice, concerts, or even as a serene background for meditation. 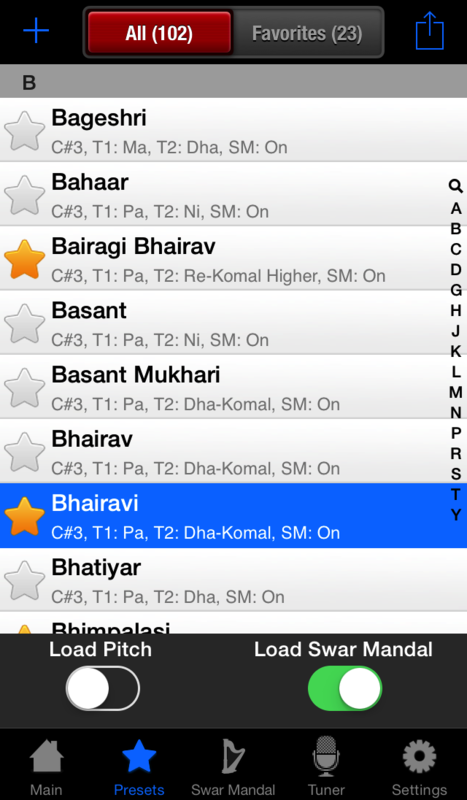 ✓FOUR fantastic instruments in one app: includes two 5-string tanpuras, a 15-string Swar Mandal, plus (NEW!) a Sur-Peti (Shruti-Box). ✓Integrated 15-string Swar Mandal: The Swar Mandal is completely tunable and can be played manually or set to auto-loop. ✓Presets: Save all settings including pitch, each tanpura's individual tuning, pan & gain settings, as well as the Swar Mandal tuning as a named preset. Includes presets for the 100+ most popular raags. And now you can also export/import presets via email or iTunes File Sharing. Not convinced? Try iTanpura Lite for free! It has all the features of the full version, except the sound stops playing after 30 seconds and it does not include the Swar Mandal. Click here to download. Top Section: This is common to both tanpuras and is used to set the "base" pitch of Sa. Tanpura 1 and 2: The middle and bottom sections are used to control the two tanpuras. Presets Tab: The Presets tab lets you load presets, delete existing ones, or save new presets. iTanpura ships with a few presets, but you can add your own as well as delete the existing ones at any time. To restore the original factory presets, just reset the presets from the settings page. A preset saves the state of all currently playing instruments. The presets table shows the details of the preset in a subtitle including the pitch, the tuning of the tanpuras, etc. ➡To create a new preset, first set the pitch, the Tanpuras, Swar Mandal, etc. Make sure everything you want to include is playing (important! ), and then click on the New Preset (+) icon on the top right. Enter a name for the preset when prompted and click OK.
➡To email a preset, first select the preset, click on the action button on the top right and choose Email Selected Preset. To send the whole list of presets (or simply back them up) choose Email All Presets from the action menu. To import presets received via email, open the email on the device, click on the attachment, and choose Open in iTanpura. ➡Choose iTanpura in the list of apps, you should now see the iTanpuraPresets file in the Documents area on the right. 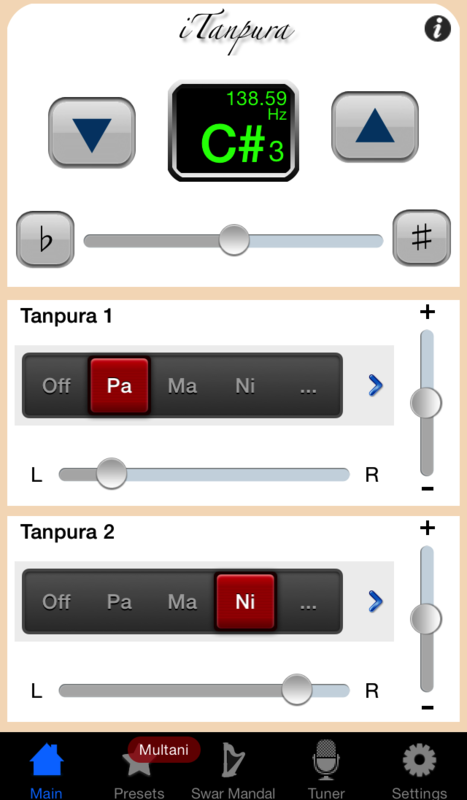 Tuner Tab: The Tuner tab lets you tune external instruments to iTanpura, or vice-versa. NOTE: This requires an iPhone or an iPod Touch (2nd/3rd gen) with an external microphone connected to it. ➡Or click on the Capture button to auto-tune iTanpura to the external instrument - this makes the captured pitch the new "Sa"
❖Lock Screen: This is the default iPhone behavior where the screen auto-locks after a period of inactivity. You can control the auto-lock timeout period from the iPhone's main settings area. This option consumes the least battery. ❖Dim Screen: This option disables screen lock and instead dims the screen after a few seconds of inactivity. Click on the screen again to brighten it. ❖Stay On: This option disables the screen lock AND keeps the screen at its regular brightness (so in effect there is NO screen saver). This option consumes the most battery. ➡Sur-Peti Tone: Turning this on will add a constant Sur-Peti / Shruti-Box type tone of Sa to the Tanpura sound. Note the tone only plays while one of the tanpuras is playing. A low value of 10-20% for the Sur-Peti volume works best. ➡Reload Original Presets: Clicking on this button will reload all the original presets the app came with. You can choose whether to delete the existing presets or keep them. NOTE: If you have any existing presets with the same name, they will still be over-written. ➡iPad (iPad 2, iPad 3, iPad 4, iPad Mini, iPad Air or newer) with iOS 6.1 or later. Recommend iPad 3 or later for compatibility with upcoming versions. Note iTanpura is not designed for the larger iPad screen, however it works fine (automatically) in compatibility mode.